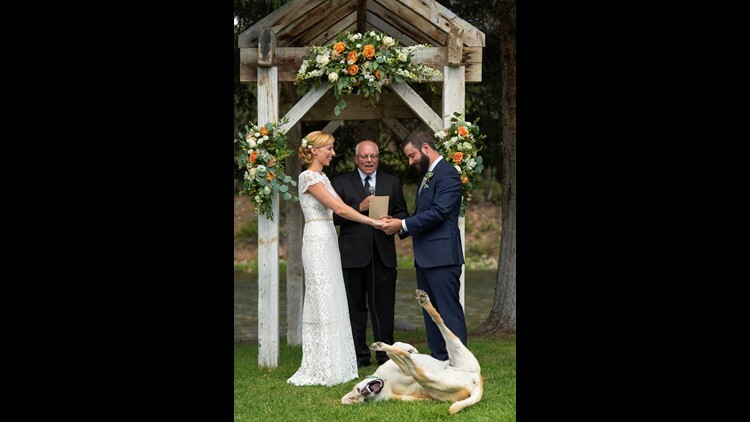 Boone, the couple's 6-year-old Labrador Retriever, photobombed the couple while they were reciting their vows. FREEBURG, Ill. — A photo from a St. Louis area couple’s wedding has gone viral. Jayce Conway and Angie Blumberg were married in Montana on July 28. The newlyweds have been best friends since preschool. They’re from Freeburg, Illinois. Boone, the couple’s 6-year-old Labrador Retriever, photobombed them while they were reciting their vows. The couple was not surprised their furry buddy stole the show, saying they think he likes being the "center of attention." As of August 6, the picture has reached over 8 million people from 5 On Your Side's original posting. It has also been picked up by various other news outlets including the Today Show.